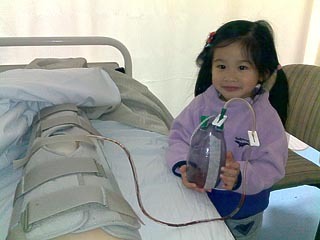 My daugter showing the drainage container to draw fluid out of my infected knee. I am from Melbourne, Australia. I'd like to share my thoughts on a difficult journey so far. 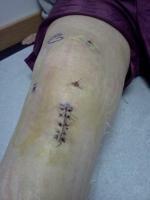 I had a right knee ACL reconstruction (hamstring autograft) on the 22 July 2009. All went well. I was out of the hospital the next day on clutches. Physio began 3rd day. On the 4th day, I was able to fully extend my knee and flex to 90 degrees. On the 8th day, I was able to walk without crutches. On the morning of the 10th day, I woke up with extreme pain and sudden swollen knee and slight fever. As it was the beginning of a weekend, I was unable to contact my surgeon. I endured the weekend with the strongest painkillers I have got. It was tough. 12th day, Monday, I turned up at my surgeon's clinic. Ordered immediate X-rays and blood test. The wound itself looks clean, no signs of infection. Suspect inflammation from over-activity. Surgeon ordered to stop physio sessions. 15th day, follow-up appointment with Surgeon. Still swollen, fever pain, lost range of motion. Suspect infection. Admitted to hospital, evening surgery to 'wash up' infected areas. After surgery, it was the first time in many days I was pain free, what a relieve! Surgeon now believes there is an infection from the 'cloudy fluids' inside. Was put on an antibiotics called Flucloxacillin via IV. Tissues from surgery sent to lab for bacteria culture. 19th day, lab confirmed bacteria was Staphy Epidermidis. Antibiotics was changed to Vancomycin via IV. Daily blood test to measure CPR which has been dropping. 23rd day - today. Discharging from hospital. Can fully extend knee and flex to 90 degrees and walk gingerly without crutches. Will be on oral antibiotics (rimycin, fucidin) for one month.